Engineered Fibers Technology, LLC, Shelton, CT, established in 1998, offers a broad range of high performance fibers and materials including precision short-cut fibers from a wide range of fiber types, as well as EFTec™ Nanofibrillated Fibers and other fibrillated fibers for technical papers and engineered materials. 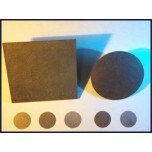 Spectracarb™ GDL porous graphite conductive papers and panels are manufactured for fuel cell and other various electrochemical devices. Spectracarb™ 2050A-0550 Gas Diffusion Layer (GDL) is a heavy duty porous “graphitized” resin bond..
Spectracarb™ 2050A-0850 Gas Diffusion Layer (GDL) is a heavy duty porous “graphitized” resin bond..
Spectracarb™ 2050A-1050 Gas Diffusion Layer (GDL) is a standard grade carbon paper GDL that is ve..
Spectracarb™ 2050L-0850 Gas Diffusion Layer (GDL) is a heavy duty porous “graphitized” resin bond..
Spectracarb™ 2050A-1535 Gas Diffusion Layer (GDL) is a heavy duty porous graphitized carbon sheet..
Spectracarb™ 2050A-1550 Gas Diffusion Layer (GDL) is a heavy duty porous graphitized carbon sheet..